Deceptively delicate in appearance this moisture- and semi-shade-loving perennial is hardy to Zone 4. Varieties grow anywhere from 1 to 6 feet tall. But most grow about 1.5 to 3 feet tall and have fern-like, dark green foliage and dense heads of tiny, wispy pink-white blooms. Prefers shady, moist sites, but needs good drainage over winter. Can grow in direct sun with constant moisture. 'Pumila' tolerates dry soil better than other astilbes. Prefers moist but well-drained soil. Can grow in drier soils if watered during dry spells. May be marginally hardy in Zone 3.
outdoor containers - Can be forced to flower inside after exposing to temperatures below 40 F for 3 months. Most varieties grow about 1.5 to 3 feet tall. 'Davidii' grows up to 6 feet tall. 'Pumila' grows to 1 foot tall. Varies with variety from white to reddish-pink and rosy purple. Variations include bronze-green and reddish green. Tiny, wispy blooms borne in dense plume-like clusters on erect, branching flower stems. bears ornamental fruit - Spent flowers are attractive and can be left until spring. cut flowers - Cut when half open. dried flowers - Cut when blooms are just open, remove all leaves, and hang in a dark well-venilated area. The dried seed heads can also be used. Propagate by division or separation - Divide in spring. Division every 3 or 4 years helps keep plants healthy. Discard old, weakened rhizomes and replant only newer, healthy roots. Deadhead if self-seeding is a problem, but it won't induce more flowering. Astilbes generally do not need staking. Remove dead leaves or cut back plants to the ground if their foliage becomes dried out and brown during summer. This will encourage more foliage growth if cool, moist conditions return, or plants may remain dormant until spring. Allow spent foliage to remain for the winter. Spent blooms are ornamental in fall and winter. Cut back to the ground in the spring. 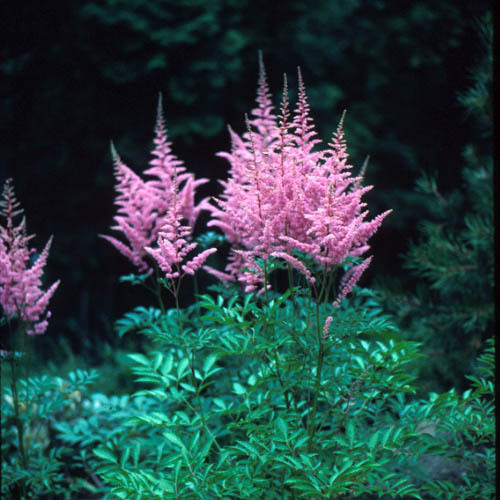 Astilbes are heavy feeders and respond well to high-nitrogen fertilizer in fall. var. davidii grows 3 to 6 feet tall with deep green leaves heavily flushed with bronze. Bears rosy purple blooms in dense, erect, branching heads. 'Pumila' grows 1 foot tall with violet-lavender blooms in late summer. Tolerates drier soils than most Astilbes. var. taquetii 'Superba' grows 3 feet tall with rose-tinted purple blooms in late summer. Leaves are deep green heavily flushed with bronze and slightly crinkled in appearance. 'Finale' grows 1.5 feet tall with rosy-pink blooms in late summer. 'Intermezzo' grows 1.5 feet tall with rosy-pink blooms in late summer. 'Purple Candles' ('Purpurkerze') grows 3 feet tall with violet-purple blooms in late summer. 'Purple Lance' ('Purpurlanze') grows 3 feet tall with reddish-purple blooms in late summer. 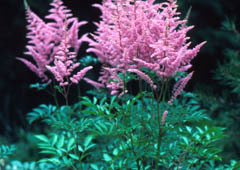 'Serenade' grows 1 to 1.5 feet tall with reddish-pink blooms in late summer. 'Veronica Klose' grows 1.5 feet tall with reddish-violet blooms in late summer. 'Visions' grows 1.5 feet tall with rosy-red blooms in mid- to late summer.